Mario Henrique graduated in Design from Lisbon’s University of Fine Arts where he started his career in online marketing and web development agencies. Later on, as a creative director, he recruited and led teams working on various digital projects in Portugal, Spain and Brazil. As partner and head of design in one of these projects, he would eventually be part of a successful exit via acquisition, and then shifted his focus to contemporary painting, which had always been a parallel interest. 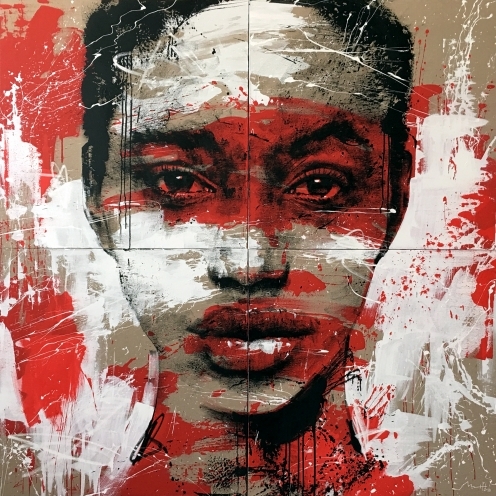 A prolific portraitist, Mario is fascinated by the unpredictability of the human behaviour: the brief glances, the impermanence of facial expressions, the sudden movements. This dynamic is also present in his ballerinas series, which lean toward the abstract expressionism. Making use of uncommon and “rough” materials, like cardboards, reversed canvases and hardware tools, he paints abruptly and spontaneously. His approach relies on drippings, splashes and paint throws, so that the physicality of the painting process is transparent in the final piece. Listed in various private collections across Europe, America and Asia, he has exhibited in galleries both locally and abroad, and was awarded an Honourable Mention for his participation in the Brasília Biennial of Contemporary Arts 2016. He was also featured in Saatchi Art’s Inside The Studio. Mario owns a studio/gallery at the Marina, in Cascais (Portugal), where some of his paintings are publicly exhibited.